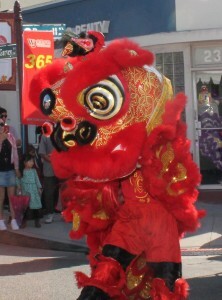 Colorful Lion dancers open the Lunar Festival Celebration in Monterey Park on February 3rd and 4th on Garvey Avenue in the downtown business district of the city. 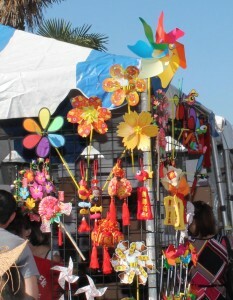 Colorfully decorated booths welcomed the residents and guests to shop for clothes, gifts, artwork, flowers and more. 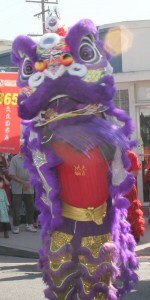 The street was full of people enjoying multi-cultural foods and beverages as they walked around the booths. Monterey Park Bruggemeyer Library’s booth gave away free books to interested guests. 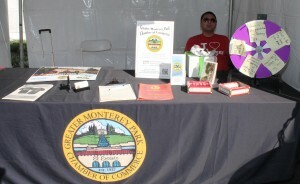 The Greater Chamber of Monterey Park’s provided information to all about the new chamber. 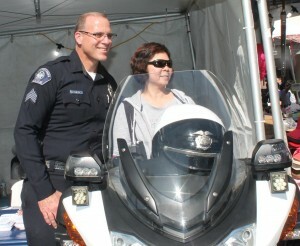 The Monterey Park Police Department’s booth provided safety information and a chance to ride on one of their motorcycles. Several friends joined Sgt. Paul Yniguez on the bike. 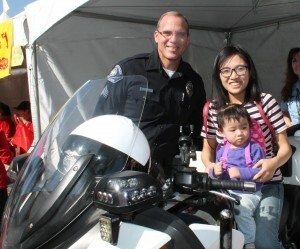 The Monterey Park Fire Department joined with the Monterey Park Police Department to patrol the festival to help anyone who became ill, disabled or to help locate lost parents. The event also had a Kid Zone for the younger set to enjoy the day. 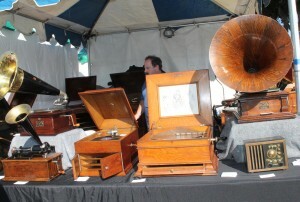 One booth features Gramophones, which played records from the past. The younger people felt they were transported back to the grandparents or great-grandparents homes. 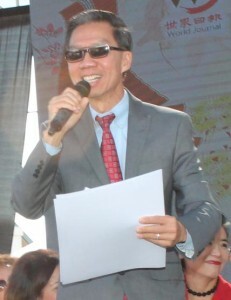 Mayor Stephen Lam greeted the crowd with “Happy New Year of the Dog”! 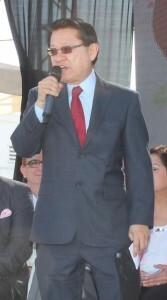 He welcomed everyone to this event, which is the biggest in Los Angeles County. 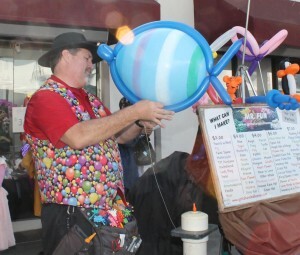 This festival was founded 20 years ago by the city and the Business Improvement District Advisory Committee (BIDAC) to attract more shoppers to the downtown. This year we have approximately 300 booths and expect 2million people to attend this two-day event. Please enjoy the Asian culture. We are a great place to raise a family and the best place to live stated by Money Magazine. 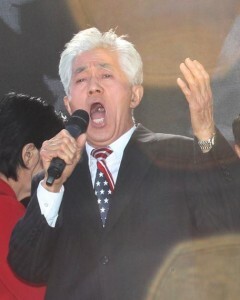 Peter Sun sang our National Anthem to the delight of the crowd who also said the Pledge of Allegiance at the beginning of the Lunar New Year festival. 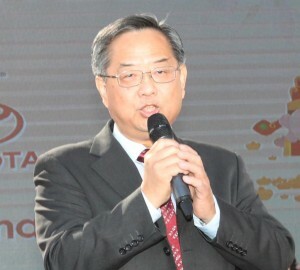 James Gao, Publisher of the World Journal Newspaper, welcomed everyone to this special event. He thanked them for their time and support. This celebration we will share each other’s cultures. We are a multi-cultural country. Happy New Year! 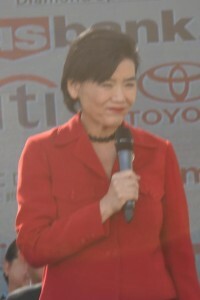 Congressmember Judy Chu wished everyone a Happy New Year! 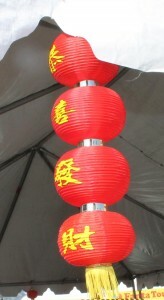 She recalled that 20 years ago we had a Flower Market to celebrate the Lunar New Year. 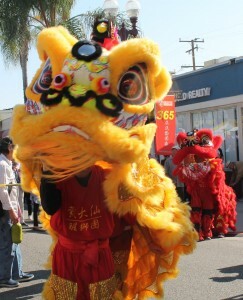 Stephen Lam, a member of BIDAC and the World Journal joined together to expand the Lunar Festival in Monterey Park. It is a great way to celebrate all of our cultures. People born in the Year of the Dog are strong leaders, smart and have a strong sense of responsibility. She presented proclamations to the Councilmembers, City Clerk, BIDAC members and the World Journal in honor of this celebration. Supervisor Hilda Solis said dogs are loyal. 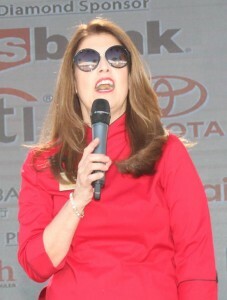 She represented Monterey Park in Congress from 1994 until she retired to serve as Secretary of Labor. Now she is our County Supervisor. She thanked Judy Chu, all of the elected officials and residents who make our county great. The county supports the residents. She asked God to bless all of us. She promised to give the Councilmembers, members of BIDAC and the World Journal proclamation at the next Supervisors’ meeting. Assemblymember Ed Chau congratulated and thanked Monterey Park, the World Journal and the BIDAC for celebrating our diversity. He also thanked the vendors for their support. He presented proclamations to the Councilmembers, City Clerk, members of BIDAC and the World Journal in honor of the festival. Mayor Pro Tem Peter Chan wished the crowd a “Happy New Year”! The New Year offers a sense of hope. The New Year is a time to reset the year. New hope. Wishing all of us peace and happiness in the New Year. Assemblymember Phillip Chen from Diamond Bar said he is happy to be here to honor his roots. He is a second generation American. 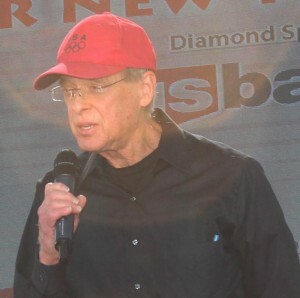 He thanked the World Journal, the city and BIDAC as he presented them with proclamations of appreciation. 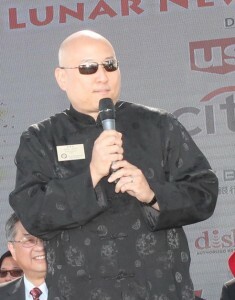 State Senate candidate Mike Eng welcomed the guests to Monterey Park’s Lunar New Year celebration. This is the Year of the Dog. He recalled that 130 years ago Richard Garvey delivered mail for the Pony Express on Garvey Avenue from Los Angeles to San Gabriel. We are the gateway to many cultures. He would have approved of the diversity of the city. He congratulated the Council, BIDAC and World Journal for this festival. 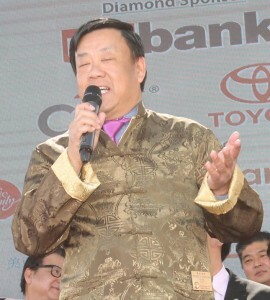 Mayor Lam introduced other guests and elected officials that included Monterey Park’s former mayors: Lily Chen, David Lau and Anthony Wong to the audience. 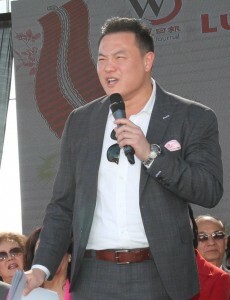 Councilmember Hans Liang welcomed everyone to our Monterey Park Festival. 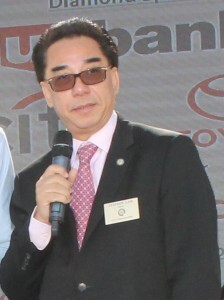 He thanked James Gao from the World Journal for their support of the event. It gets better every year. He also thanked members of the BIDAC for their support. He thanked City Manager Ron Bow, Robert Aguirre and their staff of their hard work producing this event. He also thanked the elected official for their support. “Happy Year of the Dog”! Councilmember Mitch Ing welcomed the crowd to Monterey Park. He said people born in the Year of the Dog are loyal and protectors of their family. 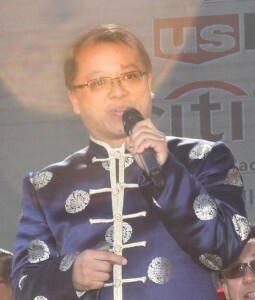 He thanked the World Journal for sponsoring this event. We have some good food to enjoy. Have a great day! 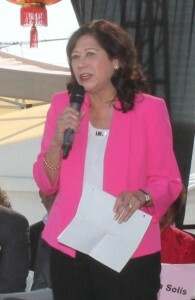 Councilmember Teresa Real Sebastian thanked everyone for attending our festival to enjoy the New Year. Celebrate with your family and your friends. She wished everyone “Good Fortune and much love. Happy New Year”! 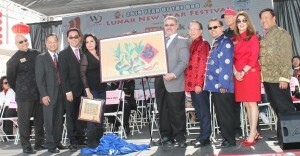 City Clerk Vince Chang welcomed everyone to the Lunar New Year festival. He is pleased to serve the great city of Monterey Park. We are the best city to live in and raise your families. Please visit the stores as well as the booths. Enjoy the “Year of the Dog”! Johnny Thompson, a longtime resident, business owner and member of BIDAC thanked the other members of BIDAC, Monterey Park and the World Journal for the great job they did together bring their expertise to put this event on. Thank you! The United States Post Office with the help of the elected officials unveiled the “Year of the Dog” stamp. 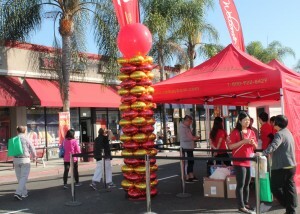 The Monterey Park Post Office had a booth that sold their special event stamp to the public. You can purchase this stamp at your local post office. 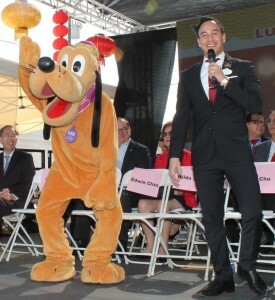 Walt Disney’s world famous dog “Pluto” with his friend, Mickey Trujillo jointed the party. He greeted all of his fans both on the stage and at the Disney booth where he enjoyed taking pictures with them. 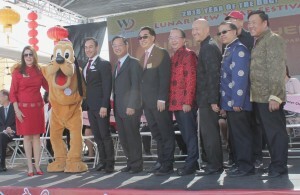 Pluto was very happy to celebrate his “Year of the Dog”! 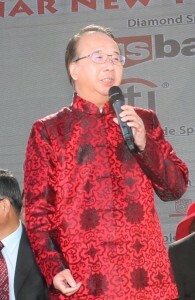 Mayor Lam thanked all of the sponsors. He ended his duties as Master of Ceremonies with Enjoy the celebration! 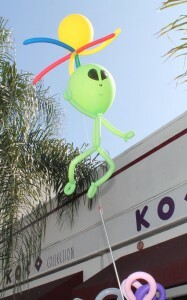 Children of all ages requested balloons fashioned like hats, toys, animals and more. 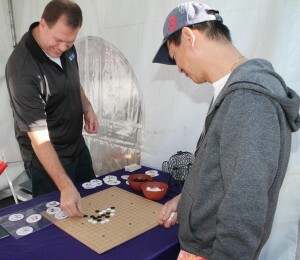 This was one of the many booths that offered fun, educational information, food, drinks, flowers, gifts and more. 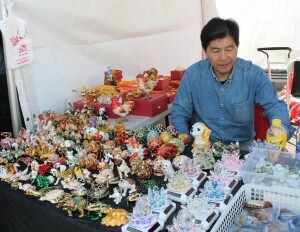 The “Year of the Dog” festival celebrated in Monterey Park was just one of the many ways people celebrate the Lunar New Year.